Jayandran Mohan considers the health assessments and physical training that minimise the risks when working at height. Work at height is work in any place, including a place at, above or below ground level, where a person could be injured if they fell from that place. Access and egress to a place of work can also be work at height. Examples of work activities that are classified as working at height include: working on trestles, flat and fragile roofs, ladders, fragile materials on ground level adjacent to an excavation, formwork within an excavation, erecting false work or formwork, elevated platforms, and climbing on poles, chimney stacks and scaffolding. The main hazards associated with work at height are falls and falling objects resulting in death, neck and spinal injuries leading to permanent paralysis or multiple broken bones. Falling objects can also cause severe injuries that may result in death, brain damage, paralysis or multiple broken bones. By doing a risk assessment and applying the risk prevention hierarchy, the proper control measures will be implemented by the employer to control the above hazards. Along with the control measures, the primary proactive measure in work at height safety is doing effective health assessment, along with maintaining employees’ fitness by providing efficient ergonomic training. It is the responsibility of the employer to carry out work at height risk assessment and consider the aspects such as edge protection, fall protection and protection from falling objects by ensuring the following barriers to prevent items from slipping or being knocked off the edge of a structure: objects/tools secured onto the structure (e.g. scaffolding) when not in use; or an exclusion zone created beneath the area where the work is taking place. 1. Modifying the work process, e.g. work from ground level and design modifications such as changing the structure’s build process so that steel is erected at ground level and craned into place. 2. Providing a safe working platform, e.g. scaffold with guardrails and properly installing safety equipment such as rope access equipment. 3. Minimising the distance of falls by providing fall arrest equipment, e.g. harness and lanyard. 4. Minimising consequences of falls by providing a soft landing, e.g. safety nets, air bags, etc. 5. Provide effective training and supervision and deploying competent workers. 6. Implementing preventive active monitoring, inspection and maintenance of access equipment like ladders and MEWPs. The specific health conditions which may preclude the individual from working safely at height are recurring dizziness/altered balance, epilepsy, diabetes, psychiatric conditions (including a fear of heights), heart disease, severe lung conditions, alcohol and drug abuse, significant impaired joint function/mobility issues, cognitive disorders (e.g. dementia/brain damage), reduced communication skills (deafness, visual impairment). ILO Occupational Health service 1985 R171 Section B 11 (1a) says that the employer has to carry out a health assessment for the worker before deploying them into high risk activities. The following medical assessments are carried out to ensure an individual is fit to work in a specific environment. People who are involved in work at height activities such as industrial abseiling, rigging, telecommunications engineering and many more may require a medical review to check their fitness for a specific work role. There should be a full range and power of movement in all four limbs. An amputation will normally be a contraindication to this work. There should be full recovery of muscle bulk and power after a fracture. There should also be full mobility of the spine. Good movement of the cervical spine is particularly important. Excess body fat is a weight penalty during climbing and also indicative of a low level of habitual activity. Obesity should be judged clinically and by use of appropriate height/weight tables. 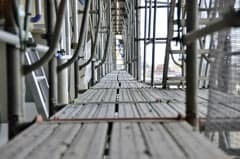 Individuals weighing more than 15 - 20 per cent more than their ideal weight are unlikely to be acceptable for work at height. A detailed examination of the existence of any heart disorders such as Ischaemic heart disease, Vasovagal attacks or Vertebrobasilar insufficiency. Individuals fitted with permanent cardiac pacemakers will require careful assessment of their underlying conditions. Any lung disease, either obstructive or fibrotic, which significantly impairs lung function is likely to be a contraindication. In case of doubt, lung function should be measured by peak flow reading. Neoplastic disease of the lung is an absolute contraindication. Diabetes controlled by diet alone will be acceptable, but insulin dependent diabetes will not. Diabetes treated by diets and oral hypoglycemic agents may be acceptable if there is no history of hypoglycaemic episodes or other complications of the disease. A history of any seizure is a contraindication. There should be no history of unexplained episodes of loss of consciousness. There should be no history of episodes of vertigo or giddiness or of conditions affecting balance, such as Meniere's disease or chronic middle ear disease. Balance should be tested clinically. Migraines, particularly if they result in visual symptoms, are likely to be unacceptable. Consideration should be given to the possible CNS side effects of prescribed medication. Alcohol or drug dependence will be a contraindication. Severe anxiety, neurosis, a history of a psychotic illness, or acrophobia (fear of heights) will be a contraindication. A good level of hearing is required in the speech bandwidth (defined as 300-3,400 Hz). Visual acuity uncorrected should be a minimum of 6/36 in each eye. Visual acuity corrected should be 6/12 in each eye. This means that the person with impaired vision can see at six meters what a person with normal vision can see at 12 metres. Where correction, either by spectacles or contact lenses, is required, a spare pair of spectacles should be carried. Visual fields should be full in both eyes. Monocular vision is not acceptable in any applications, but may be accepted in an experienced rigger after a suitable period of adaptation has elapsed. The history of the habitual level of exercise undertaken at work and during leisure time will provide some insight into the likely level of an individual's fitness. The best test is the ability to undertake the work required, but it is desirable that a check of physical stamina is made before this is undertaken. For use in the consulting room a step test is most convenient, with pulse rate returning to near-resting levels within two minutes. Ergonomic training combines three forms of exercise: body weight exercises, flexibility exercises and yoga postures. As is the case with any form of exercise, incorrect posture and poor form can cause injury. The guidance of a competent fitness trainer or occupational yoga therapist should be sought if in any doubt regarding the correct form for any of the exercises mentioned in this article. By completing ergonomic workouts the physical and mental stamina of workers heavily involved in work at height is maintained, which directly reduces the incidence rate of unsafe acts of individual behaviour. This results in an optimistic and proactive safety culture in an organisation. The following body weight exercises are workouts workers can undertake to increase the likelihood of surviving a fall, to assist in being rescued or to enable self-rescue. Climbers and people who work from ropes have incredibly strong hands and shoulders. They know that their lives depend on being able to hold on. A good exercise of hand and shoulder strength is to hang from a bar for one minute. An individual who can manage this has the ability to save to himself. After completing this challenge with two hands, the worker should then try hanging from just one hand. A pull-up requires core strength, hand strength and arm strength and is the best exercise to maintain a good strength to weight ratio. Rescuing another person or doing a self-rescue after a fall will nearly always require the ability to pull up. People with an excellent strength-to-weight ratio can do 10 pull-ups. Elite climbers can do 20-30 pull-ups without stopping. Train the workers to do 50 pull-ups in less than seven minutes in any combination of sets. An adequate level of strength-to-weight for most people who wear a harness and work at height is between three and five pull-ups. Push-ups require core strength, neck strength and arm strength. A healthy and fit person should be able to do 100 push-ups in less than 10 minutes in any combination of sets that works for the individual. A worker involved in height activities must be able to complete 10 push-ups without stopping. Squats require strength, flexibility and balance. In an evacuation or during an emergency rescue there is a need to climb stairs, ladders or over obstacles. These manoeuvres require leg strength. Performing a self-rescue after a fall nearly always requires being able to do a one-leg squat. While it may seem an absurdly high number, a healthy and fit person should be able to do half as many squats as his weight, so 100 squats for a worker weighing 200 lbs etc. If a worker can not do even 20% of this, then the worker’s ability to evacuate, rescue and self-rescue will be greatly reduced. Flexibility exercises are very important as evacuation and rescue require a certain amount of flexibility to reach, contort and climb over obstacles. • Touching the middle of the back with either hand by reaching over the shoulders. As with the strength exercises, flexibility exercises will improve the chances of being able to evacuate, self-rescue and rescue someone else. The yoga mode of ergonomic training is composed of postures that improve both physical and mental wellbeing, which concretely provide fitness for work at height. To maintain medical fitness the following yoga workouts can be done under the supervision of competent yoga professional. Pranayama is the formal practice of controlling the breath, which yogic philosophy believes to be the source of our prana, or vital life. Ustrasana (Camel) is an intermediate level back-bending yoga posture that adds flexibility and strength to the body, while also helping to improve digestion. Virabhadrasana (Warrior) strengthens and tones the arms, legs and lower back, improves balance in the body and helps to increase stamina. Shashankasana (Hare) is so called as it resembles a hare in the final position. Benefits of Shashankasana include relaxation, relieving depression and cardiac ailments, and a good upper body stretch. Tadasana (Mountain) is highly helpful for active hearing. Bhramari pranayama (Bee breath) is a very effective breathing exercise to release the mind of agitation, frustration or anxiety and get rid of anger. It helps to improve focus and coordination between both eyes. Surya Mudra helps to heat the body and raises the metabolism. It is also an excellent posture to aid weight loss. Adho Mukha Svanasana (downward dog) releases tension from your spine while strengthening arms, shoulders and back. It is a mild inversion that calms the nervous system and helps relieve stress. Gyan Mudra is highly helpful to control and dispel excessive anger, emotional instability, anxiety, short temper, irregular or disturbed sleep, laziness, lethargy, depression and insanity. Urdhvamukha svanasana (Upward facing dog) strengthens the back, thus relieving the body of lower back ache. Most of the body weight is borne by the arms and wrists, thus strengthening them. RIDDOR has reported that 2,950 specified injuries and 3,117 over seven day injuries occurred in Great Britain related to falls from height in 2014/15. Along with the implementation of advanced risk assessment, risk prevention hierarchy and control measures, the requirement of fitness and health assessment is equally important as it improves behaviour, attitudes and competence when working at height.